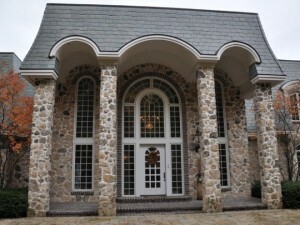 Come November 14th 2012, Door County’s largest and possibly most exquisite cottage goes on the auction block. Built by Chicago philanthropist Judith Blazer in 1993, “Sur la Baie” is one of the largest single-family residences in Wisconsin, according to Hilco Real Estate Auctions LLC, which is in charge of the auction. Designed with the French tradition in mind, the “cottage” estate has 43 rooms, including: three grand guest suites, 14 bathrooms, a two-story library, movie theater (and vast movie collection to boot! ), indoor pool – plus a mind-blowingly large master suite with two dressing rooms, two bathrooms, a sitting room and a fitness room – all accessed via elevator. Door County land records show the assessed value at $16 million and last year’s taxes were $139,400. If you don’t have the funds for a bid on “Sur la Baie”, consider something a little less stately yet just as charming – a week’s vacation at “Above & Beyond” cottage rental on Washington Island, Door County. Nestled in the woods with 300 feet of private beachfront, I’d venture to say that our Wisconsin cottage experience is the next-best-most-affordable-thing to “Sur la Baie”.